Pictured below is a modification of our standard Mini REUK Dawn/Dusk Lighting Controller which has the addition of a regulator on the output so that it can be connected directly to LED lighting, and connections to enable a PV solar panel to be connected to the battery via the board. We used an LM2940CT-12 regulator on the output side which will supply up to 10 Watts of 12.0V output to protect sensitive LED lighting from excessive voltage from the solar charged battery. (If the battery voltage falls below around 12.3V, the output voltage will fall to around 0.3-0.5V below the battery voltage). We added a Schottky Diode to solar panel input so that the battery will not drain charge through the solar panel at night. 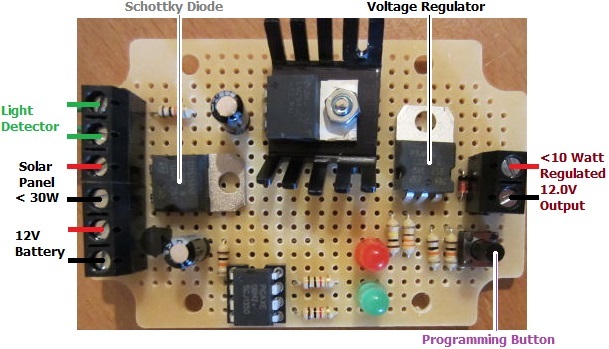 A Schottky type diode was chosen as only around 0.3V of solar voltage is dropped through it compared to the 0.6V+ typically dropped through a standard silicon type diode.